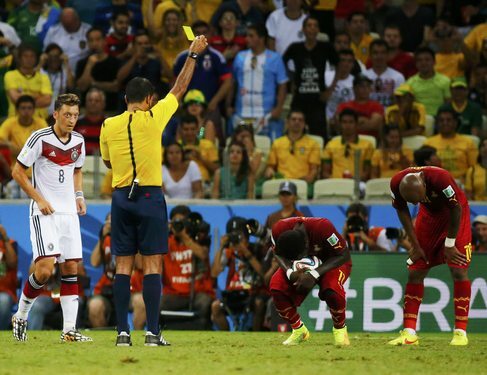 The standard of refereeing has been a talking point in this World Cup since before the tournament even started. Hardly a surprise; referee bashing should be a sport in and of itself. But while there have definitely been some issues, there have been some excellent performances, as well. Kuipers has been outstanding throughout the tournament, and indeed, throughout the international season. He really is establishing himself as the best there is. His positioning is perfect, and his demeanor with the players is calm and relaxed and yet still very much authoritative. He kept the game flowing. This was the first time we’ve seen that easy manner in which he maintains control of a game without getting in the way, but it wasn’t the last, and most likely we’ll see him in the latter stages of the tournament. Webb might have struggled a bit in league play this year, but he’s been outstanding in the Cup. Coming into Brazil, I wouldn’t have thought him a candidate for the final, but he’s becoming harder to ignore the more he referees. The non-calls that he was so maligned for in EPL are serving him well here, allowing games to flow. His ability to control a match through sheer personality is important as well, with referees being directed to give yellows only when necessary. In this match, he disallowed a goal for Brazil on a Hulk handball that looked iffy at first but replays showed to be absolutely correct. It was a brave call that showed confidence in not only his team, but himself. He made very few mistakes in this match, and handled it with such aplomb that I forgot about him for long stretches. His presence was such that he was treated with near universal respect by the players. Geiger had a good tournament, with the exception of one unfortunate game. This match was by far his biggest assignment, and his best performance. He was very firm with both teams, keeping the game moving while still allowing the players to play at an exciting tempo. In the second half, he was fairly invisible, which is what you want from your referee. His fitness is also impressive and he kept up with play admirably. 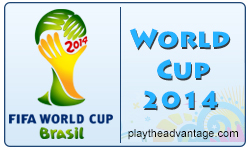 Agree on the performances, but would like to add Pitana’s performance in USA-Portugal. His management was very good, decisions characterized by match understanding and his AR2 Belatti had two amazing ONSIDE GOAL decisions to make. Was the most impressive South American performance imo. HAHA! You got me….Pitana was number six! Maybe next time you should give the referee’s a score rating, so you can keep track also. Cause a referee is only as good as his last match imho. And Geiger really countered his great first match with a weaker performance now. We are entering the top 8 and should therefore need the top 8 referee’s. He was good but he is not amongst them now. It is knock-out stages here too. You know, I thought about that, and I knew people would ask me who I thought for the quarterfinals. But I wanted to do something really positive. Look, I dumped all over Geiger for France v Nigeria. But a good performance is a good performance. 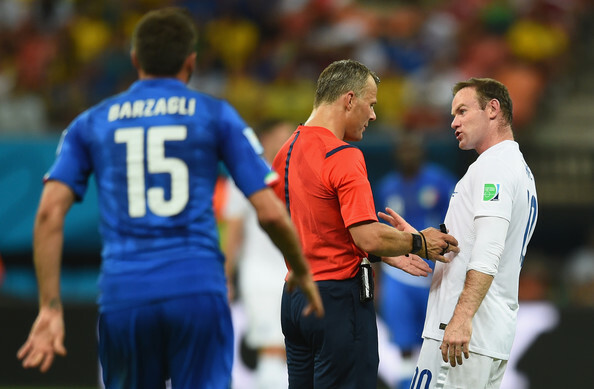 And I wanted to show that the referees in this tournament have often been excellent, particularly in big games. There are other blogs doing “worst referee performance”, so I thought I’d go the opposite direction… And I try to be neutral. 🙂 Actually, I almost had a longer list…Rizzoli would have been 7 or 8 with his last outing. He was great then. Actually, both mentions of Algeria and Argentina seem to be correct. I know I just woke up, but I can’t find any mixup. What are you seeing…? I assume the picture of Ricci is the players bowing in awe and deference. 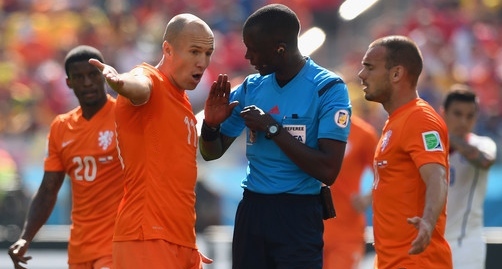 Kuipers got word that he won’t be refereeing any game anymore, it is in the Dutch news. It was to be expected, with the Netherlands in the semis and the rivalry going on between the Netherlands and Germany, but still it’s a pity. 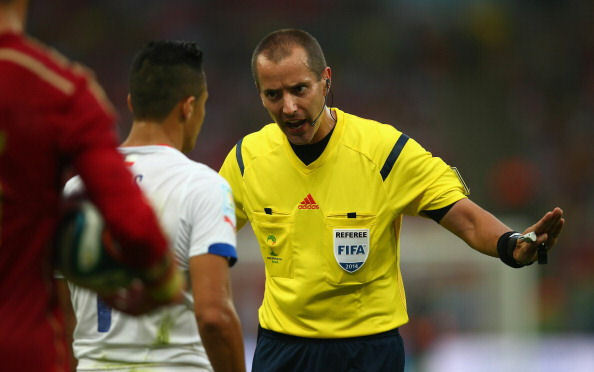 I had hoped for perhaps refereeing an Argentina-Brazil match if that were to happen. I’m hoping to see Gassama again. My bet is on Geiger for the final. I think he’s still a candidate, though I personally don’t rate him.